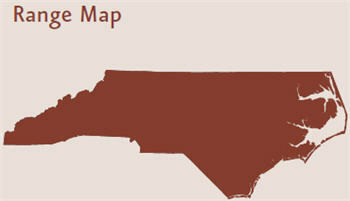 North Carolina Wildlife Resources Commission. snails, tadpoles and other small live or dead creatures. Most produce young in spring. Female produces hundreds of eggs; about 85% hatch. Number of broods varies. Scientists are not sure how long it takes for the eggs to hatch, but they estimate a month or more. When the eggs do hatch, tiny, transparent versions of adult crayfish emerge, measuring about 1/6 in. long. Young cling to the female through three molts, until they reach a size of about 1 1/2 in. Crayfish do not go through a larval stage. About 3 to 5 years. Some crayfish are generalists and occur throughout much of North Carolina, but most are restricted to smaller geographic areas. The Greensboro burrowing crayfish, Cambarus catagius, are only found around the Greensboro area, and the North Carolina spiny crayfish, Orconectes carolinensis, are only found in the Tar and Neuse River Basins in the coastal plain. Turn over a rock in almost any North Carolina stream in summer, and chances are a crayfish will dart backwards away from you or even defend the rock with its claws pointed at you. There are at least 40 different species of this common freshwater crustacean that live in Tar Heel streams, ponds, and burrows from the mountains to the coast. Many of these species are found nowhere else on earth. Crayfishes look like miniature lobsters, with a front pair of strong pinching claws, an armored body, and a broad tail. Like lobsters, crayfishes have 3 main body parts: a head, thorax and abdomen and a hard exoskeleton that protects their soft tissues and organs. The front part of the body is rigid, but the back part, the abdomen or tail, has movable segments. In the head region, 2 pairs of antennae and tiny eyes aid the crayfish in sensing its surroundings. In the thorax, crayfishes have 5 legs on each side (of their body) and soft feathery gills that are used for respiration. The first pair of legs are large claws or pincers, and these help the crayfishes catch and hold their prey. The next 4 pairs of legs are walking legs—the first 2 of these pairs are small pincers used to handle food. Under the tail and after the last pair of walking legs, there are smaller and thinner leg-like appendages called swimmerets, that aid in swimming, carrying eggs, and holding young crayfish. Depending on the species, the crayfishes’ color ranges from crimson red to cobalt blue. Some can be pink, brown, greenish black or even aquamarine. Our biologists discover and describe new species of crayfish every year and also document the spread of exotic crayfishes in the state. As more surveys are completed, biologists continue to document the range expansion and also the contraction of some of North Carolina’s crayfishes. Crayfishes inhabit streams, ponds, lakes and swamps throughout North Carolina. Stream dwellers prefer fast-moving and highly oxygenated rivers and streams of the Mountains and Piedmont regions. In slower streams, as in the Coastal Plain, crayfishes hide under rocks and logs for protection. Crayfishes can also be found in ponds, lakes, and in standing water in roadside ditches. 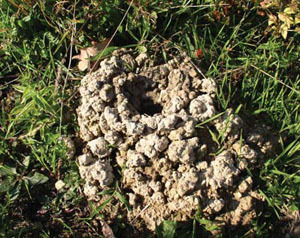 Some cray fish burrow in the ground and can dig branching tunnels up to 15 ft. deep in muddy wetlands. Most burrows average about 2 or 3 ft. deep and can be found a good distance away from standing water. Burrowing crayfishes, found mostly in the Coastal Plain and eastern North Carolina, often pitch up clay “chimneys” as they dig. Crayfishes become most active at nightfall or at daybreak, and emerge from their hiding places to feed. These tough crustaceans eat primarily aquatic vegetation, but they may also eat small, live or dead animals such as worms, snails, tadpoles and fish. Crayfishes often become prey to other animals such as bullfrogs, turtles, bass, raccoons, wading birds and hawks. But crayfish are fighters. Their best defense is a powerful tail, which propels the crayfish backward. If they lose a claw or leg in battle, a new one grows in its place. Most crayfish species in North Carolina produce their young in early spring, when food and rain are plentiful. A few species breed in winter. To mate, the male crayfish grasps the female and turns her over so their ventral sides are together. Then the male passes sperm through his first pair of swimmerets, called the gonopod, to the female. When fertilized, hundreds of tiny eggs attach to the female’s swimmerets with a sticky discharge called glair. 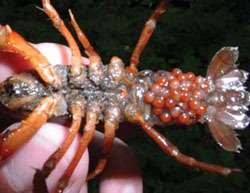 When the female crayfish has the fertilized eggs attached it is said that she is in berry. Larger females typically produce more eggs. Unlike many other crustaceans, crayfishes do not go through a larval stage but molt about 6 times in the first 7 to 8 months of life. Molting, or shedding of the shell is necessary because crayfishes outgrow their armor. They continue to molt at a slower rate for the rest of their lives. When they molt, the old skeleton falls away and the soft-shelled crayfishes grow quickly as they take in large amounts of water. Unprotected, they hide after molting and are less aggressive until the new skeleton hardens in several days. Crayfishes thrive in unpolluted water and their numbers are a good sign of a good ecology. stick the affected part of your anatomy back into the water where the crayfish will feel safer and swim away. This technique also works with snapping turtles. Note: ‘crayfish’ refers to a single species or an individual specimen, whereas ‘crayfishes’ refer to many species. Elliott, Alfred M. Zoology (3rd ed., Appleton-Century-Crofts, 1963). Kondo, Herbert, ed. The Illustrated Encyclopedia of the Animal Kingdom (Danbury Press, 1972). Pflieger, William L. 1996 . The Crayfishes of Missouri. Missouri Department of Conservation. Pitre, Glen. The Crawfish Book (University Press of Mississippi, 1993). Illustrated by J.T. Newman and Consie Powell. Photos by North Carolina Wildlife Resources Commission. 11 June 2010 | Friday, Sarah; Nichols, Robert B.